Please call a Client Service Representative at 800-842-3761 today. send the largest delegation to the CMA’s annual meeting, giving us the most powerful voting bloc in the state. We have the best staff in the state, and our CEO has invaluable connections county and statewide. It’s been an honor and an education to serve as SCCMA president, for which I am grateful and indebted. If I may paraphrase Winston Churchill: never in the history of this association was so much owed to so many by so few, or actually just one, me. Thank you. 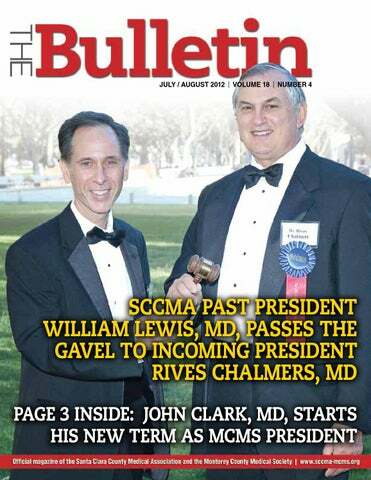 William S. Lewis, MD, was the 2011-2012 president of the Santa Clara County Medical Association. He is a board certified ENT physician and is currently practicing in the Los Gatos area. Challenge and Opportunity By Rives C. Chalmers, MD President, Santa Clara County Medical Association The following speech was presented at SCCMA’s Annual Awards Banquet and Installation Dinner on June 5, 2012. 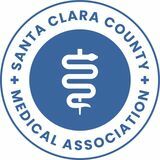 Dr. Lewis, fellow members of the Santa Clara County Medical Association, colleagues, and distinguished guests – It is a tremendous honor and privilege for me to address you as the incoming 77th President of the Santa Clara County Medical Association, the largest medical association in California. our gross national product. The U.S. government pays approximately 46% of all health care expenditures. Health care reform will include some sort of rationing and it will be decided on a political basis, not by medical leaders. I believe medical payments will continue to decrease. And after the November election, I believe that, in California, both houses will have Democratic super-majorities. If so, the current direction of medical reform will continue, whether or not the federal law is struck down. Locally, California continues to cut reimbursement to Medi-Cal recipients. Governor Brown’s proposed 10% cut in Medi-Cal across the board was disallowed by the courts, but there is simply not enough government funding to pay at current levels. In Santa Clara County, we have approximately 350,000 people on Medi-Cal, receiving their care through a countymanaged valley medical system or through the Family Health Trust with services provided by independent physicians. The population of Santa Clara County is approximately 1.8 million. The majority of these citizens receive care through large groups, such as Kaiser or the Palo Alto Medical Foundation, the academic physicians at Stanford, the V.A. Hospital, and the county-run hospitals, as well as many independent, solo, or small-group physicians. Santa Clara County Medical Association includes members from all these groups of physicians. All of our members are trying to adapt to the challenge of change in a very competitive market. All of our members are worried – they want good information on day-to-day changes, and they want to influence the course of events. What are they to do? Of all of the organizations providing physician input to these changes, the state and county medical societies are the most influential and give the voice of the physician community as a whole. For political advocacy, we have the best seat at the table. We are in a strong position to influence the direction of change, both at a local and a state level, by supporting the voice of our physicians. our members. Our slogan this year will be to “Think SCCMA.” When a problem arises, call us. We can help and we are listening. SCCMA is a team sport, and needs the input of all the members. We need more diversity – including more of the East Side physicians, especially the Asian community. We always need more young physicians. Governor Alfred Smith said, “The solution to problems of democracy is more democracy.” The base support of any democratic organization is active members, not dues paying bystanders. With this in mind, I have opened a special email, rchalmers@sccma.org for ideas, thoughts, or complaints. Volunteers? I want member input. Special thanks to the association staff, particularly the preeminent CEO in California, William Parrish, Mark Christiansen, Jean Cassetta, Pam Jensen, Sandie Becker, Sharon Jensen, Shannon Landers, Sherin Varghese, Marcy Yarbrough, and Maureen Yrigoyen, the voice of the medical association. Thanks to my office staff, Jeanne and Megan, my sons, Alex and John, his wife Ashley, and especially my wonderful wife of 42 years, Ann. Thank you for this great honor to represent the association as president. I am humbled and excited by this challenge and I pledge to do all I can to move us forward. and needs. These enhancements will come in several forms, mostly organized through our website. These ideas include improved access to your local, state, and national legislative representatives, as well as CMA representatives, polling on current/proposed health care policy, consultation to legislators, regular legislative updates, and more. I hope through these changes to increase the value of the service that you have purchased by becoming a member of the society, and I am always open to additional ideas to increase that value. Please feel free to contact me through the MCMS website at www.sccma-mcms.org. The essential role of the physician is as patient advocate, through the practice of medicine and through the maintaining of the quality of that practice. There is no reason that that advocacy needs to stay constrained to the exam room. The MCMS and I look forward to helping further your advocacy in the upcoming year. individual mandate provision, guarantees insurance coverage for most of the uninsured patients in California. It has been the California Medical Associationâ&#x20AC;&#x2122;s goal for decades to achieve universal health insurance coverage. Despite this monumental step forward, there is tremendous work to be done to ensure appropriate implementation here in California. Moreover, there are many problems with the law that need to be fixed to make the ACA work. CMA has long advocated for affordable access to care for California’s uninsured and for an expansion of health insurance coverage. However, as physicians, we know that insurance coverage alone does not mean access to doctors. Throughout the federal health care reform debate, your CMA advocated for meaningful changes to the health care delivery system that build on what works, while fixing only what is broken. In addition to supporting the individual mandate, CMA has also fought for the protection of the physician-patient relationship from third-party interference, for meaningful reforms to the for-profit health insurance industry, and for sufficient resources to deliver on the promise of improved access to doctors. CMA has also supported eliminating egregious health insurance cancellation practices, pre-existing condition exclusions from coverage, lifetime or annual limits on benefits, and excessive insurer profit and administrative costs. These reforms will ensure that patients are not denied health insurance based on what illnesses they have, but rather will help to guarantee coverage for all. While the individual mandate is essential to making coverage affordable for all, these insurance industry reforms are also critical to making the ACA work. The ACA also made important investments in primary care, primary care training, rural health care, medical homes, public health and prevention, funding research on the effectiveness of different treatments, and increased payment rates, albeit temporary for primary care physicians and related subspecialties in Medicare and Medi-Cal. However, the legislation has left several serious problems unresolved, most specifically the underfunding of Medicare and Medicaid. For a decade, California physicians have been calling on Congress to eliminate the flawed Medicare Sustainable Growth Rate (SGR) fee-for-service payment formula and adopt a long-term path to an alternative payment system that recognizes the real drivers of health care costs. That issue was not addressed in the ACA, and physicians are now facing a 32% cut in payment rates for Medicare patients at the end of this year. The Medicare Advantage rates are being cut as well. Many physicians will not be able to sustain such cuts and remain in the Medicare program, which would have grave negative impacts on Medicare seniors as well as private patients. CMA and our partners in this fight will continue to work with Congress to find a long-term solution that addresses this serious threat. tended to impose the penalty of withdrawing all Medicaid matching funds, including funding for current participation levels. The court found that the penalty portion of the Medicaid expansion provision is unconstitutional, but that the provisions of the ACA that expand Medicaid are otherwise valid. Therefore, it is up to the states to decide whether to expand Medicaid – the federal government cannot withhold federal matching funds if states do not comply. This Medicaid ruling will not affect California, because the state has said they will continue to move full steam ahead in implementing the ACA. As your CMA president, I understand that the ACA and the Supreme Court ruling are controversial among California physicians. However, there is deep support among the large majority of you for the individual mandate and universal health insurance coverage. I want to assure you that CMA is firmly committed to advocating for improvements and reforms to the ACA that will ensure everyone can actually see a doctor when they become ill or injured. We will be aggressive in pursuing appropriate payment reforms so that you can sustain your practice. We will continue to be vigilant in fighting to protect us and our patients from any government or private insurance intrusion into the doctor-patient relationship. CMA will keep you updated on ACA implementation issues, such as the state Health Benefit Exchange and health care delivery innovations, and their impact on our practices. Physician involvement in its implementation is crucial to a successful health care system. Labeling Genetically Engineered Food By Ken Yew, MD In September 2000, 35-year-old Grace Booth was having a business lunch with coworkers where she ate three chicken enchiladas. She later recalled the food as being very good, but then something went wrong. “I felt my chest getting tight. It was hard to breathe...I thought, Oh my God, what is happening to me? I felt like I was going to die.” Her coworkers called an ambulance and in an emergency room in nearby Oakland she was diagnosed with severe allergic reaction. She later discovered that the tortillas in the enchiladas contained a controversial genetically-modified corn, Starlink, which was only approved for consumption in livestock because of concerns over allergenicity.1 Aventis, the makers of Starlink, had argued with FDA officials for its use in human consumption.2 Had this been approved and an ongoing recall in human food not been in place, Ms. Booth may never have found out about her exposure to Starlink corn. As of this writing, there is no requirement to label products containing genetically engineered (GE) foods. Such concerns lie at the heart of the grassroots movement, currently underway in California, to label such foods. Before you start to think that you can’t possibly be eating GE foods because you know better, realize that if you eat any kind of processed or convenience food, you probably already are. The main GE products in the United States are corn, soy, cotton, and canola. Fully 89% of soy, 83% of cotton, 75% of canola, and 60% of corn crops in the United States are genetically modified.3 Now think of all the soy, cottonseed oil, canola oil, and corn syrup in the foods you eat. What About the Benefits of Genetic Engineering? Our economy depends on the idea that consumers are knowledgable about the products they purchase, which ultimately determines through market forces the best price for things. Because of no small effort of industry lobbying, GE ingredients in this country are not labeled as such and they can, therefore, be hidden even in foods advertised as “all-natural.” GE foods are already either banned completely or labeled in 40 other countries. Because of the lack of labeling, there cannot be post-market surveillance of the health effects of GE foods. We, therefore, have no idea how safe GE foods are because their health effects cannot be tracked. This is not an ideological issue. It is a common-sense issue that affects us all. Currently, there is a grassroots movement to label GE foods in California through a ballot initiative. To learn more about the ballot initiative to label GE foods in California, go to www.labelgmos.org. a Genetically Modified Maize Reveals Signs of Hepatorenal Toxicity,” Arch Environ Contam Toxicol 2007 (52): 596-602. 8. Spiroux, J et. al. “A Comparison of the Effects of Three GM Corn Varieties on Mammalian Health,” Int J Biol Sci (5):706726. 9. Kilic A, Akay MT “A Three Generation Study With Genetically Modified Bt Corn in Rats: Biochemical and Histopathological Investigation” Food Chem Toxicol 2008, (46): 1164-70. 10. Malatesta, M et. al. “Ultrastructural Morphometrical and Immunocytochemical Analyses of Hepatocyte Nuclei From Mice Fed on Genetically Modified Soybean,” Cell Struct Funct 2002, (27):173-80. 11. Arregui, MC et. al. “Monitoring Glyphosate Residues in Transgenic Glyphosate-Resistant Soybean,” Pest Manag Sci 2004, (60):163-166. 12. Benachour, N et. al. “Time and Dose-Dependent Effects of Roundup® on Human Embryonic and Placental Cells,” Arch Environ Contam Toxicol 2007, (53):126-33. 13. Gasnier, C et. al. “Glyphosate Based Herbicides Are Toxic and Endocrine Disruptors in Human Cell Lines,” Toxicology 2009, (262):184-91. 14. Gurian-Sherman, Doug Failure to Yield: Evaluating the Performance of Genetically Engineered Crops, Union of Concerned Scientists, 2009, p.13. 15. Biothai (Thailand), CEDAC (Cambodia), DRCSC (India), GRAIN, MASIPAG (Phillipines), Pan-Indonesia, UBINIG (Bangladesh), Grains of Delusion: Golden Rice Seen from the Ground, 2001. Register by September 28: Contact nancy.carol@johnmuirhealth.com or call (925) 947-4466 ext 35426. MCMS President John Clark, MD, receives the gavel from MCMS Past President James Ramseur, Jr., MD. MCMS 2011-2012 President James Ramseur, Jr., MD, receives Presidential Appreciation Plaque. and Steven Vetter, MD, as treasurer. The MCMS board of directors are Paul Anderson, MD; Valerie Barnes, MD; Jose Chibras, MD; Ronald Fuerstner, MD; James Hlavacek, MD; David Holley, MD; John Jameson, MD; Eliot Light, MD; R. Kurt Lofgren, MD; and Jeff Keating, MD. The annual meeting was a great success and a lot of fun! MCMS members, their families, and special guests enjoyed a fantastic meal, a bonfire and roasting marshmallows on the beach, camaraderie, and a great program to wrap up the evening. MCMS members, sponsors, guests, and staff enjoy the bonfire and roasting marshmallows on the beach. Jose Chibras, MD; Mark Christiansen, BME Manager; and William Parrish, MCMS CEO. John Clark, MD, MCMS President 2012-13; James Ramseur, Jr., MD, MCMS President 201112; and William Parrish, MCMS CEO, catching some waves. SILVER Community Health Plan Over 60 members and guests enjoyed the eveningâ&#x20AC;&#x2122;s festivities. cal students gave high-schoolers their first introduction to cadaver dissection. Afterwards, students, needing fresh air, embarked on a tour of the beautiful Stanford campus. A panel of medical students shared college and medical school admissions information strategies and gave the high school students and parents plenty of time for Q-and-A. They all shared a wonderful lunch and received certificates of completion given by Dr. William S. Lewis, 2011-2012 SCCMA President. As staff to this wonderful program and liaison to the medical students, I would like to thank the following medical student leaders who have helped make this program so much fun and such a success: Ed Pham, Michael Chiu, Duy Dao, Shawn Lin, Jennifer DeCosteLopez, Cesar Lopez Angel, Grace Kim, Isabel Nga Lai, Allison Truong, Rachel Lee, Nicole Arkin, Joseph Kamil Antonios, Ange Wang, and Michael Henderson. Also a special thank you to the following SCCMA physicians for volunteering to present at the SSTEM programs through the last few years: Drs. Howard Sutkin, Cindy Russell, Annette Chavez, Lynn Smolik, Richard Silberstein, Martin Fishman, Brian Ward, Stephen Harris, Sudha Rao, William Ricks, Felix Lee, Anh-Quan Nguyen, David Hyun, Sameer Awsare, Michael Stein, Jessica Murphy, Madhur Bhatnagar, Randell Camantigue, Donald Mordecai, and Sarala Rao. Going forward with the program, we are hoping to seek hospital funding to expand the program and invite the media to see what things are being done to encourage high school students to think about being a doctor. A special thank you to the SCCMA Council/board for providing funding and support, and to everyone involved for helping to inspire the next generation of doctors! High school students from the SSTEM program in May 2012. Students get a session on surgical knots and suturing. Learning about physical exams and vital signs. Thank You for Supporting the Monterey County Medical Societyâ&#x20AC;&#x2122;s Resident Fund Thank you MCMS for the Resident team jackets. The Institute for Vascular Testing (IVT) invites both you & your staff to our Open House & Free Screenings on Thursday, August 23 from 5-8pm. 919 Fremont Ave, Los Altos Beautiful turn-key dental suite, fully plumbed, gorgeous, must see! 5+1 Operatories included. 2930 Aborn Square Rd., San Jose Aborn Square Shopping Center. Neighborhood shopping center with wide array of retail tenants with Ross Dress For Less anchor. 2-story, elevator served building located in close proximity to the Loyola Corners District of Los Altos. Office &/or Medical office. 50 E. Hamilton Ave., Campbell Corner of Campbell Ave. and E. Hamilton Ave. Minutes from Good Samaritan Hospital & O’Connor Hospital. 1374 E. Hamilton Ave., Campbell Newly renovated medical/dental building with established dentist. Unit is in shell condition. 700 W. Parr Ave., San Jose Multi-tenant medical office building in Los Gatos. The suite is improved with CT infrastructure, and features a reception area, ensuite restroom. premium quote, so you’ll be prepared in the event your rate increases on renewal. If you have any questions, or would like to get an immediate indication of your potential savings, please call a Marsh Client Service Representative at 800/842-3761 or email CMACounty.Insurance@marsh.com. crease in enrollment. Jim has a long-time relationship with the county’s Native American community. He successfully lobbied the Board of Supervisors to increase funding for the Indian Health Center ($150,000 on-going) to better meet the medical, dental, counseling, women and children, nutrition, and other community health services to the American Indian population. In 2006, he won the Assembly District 24 race. He has been reinstated twice, and expects to run for the 15th District Senate seat this year. Since arriving at the State Capitol, he has focused on health care, creating more jobs, upgrading our transportation system, improving the foster care system, supporting green technology, and ensuring that those with disabilities are treated equally. As a legislator, he coauthored SB 810, the universal health care bill, supported Feuer’s bill (AB 52) that would allow the State Insurance Commissioner to regulate health plan rates, and introduced AB 12 – a shared partnership between small businesses and the county to provide affordable health insurance coverage to small business employees. AB 12 was passed and signed into law. The following is what a couple of colleagues have to say about Jim and the work that he has done in the field of health: “Jim was one of the county supervisors that initiated the Healthy Kids Program and the Children’s Health Initiative. We were the first county in the United States to make the effort to bring universal health care to all children in our county. At the start of the program, one out of every six children did not have medical, dental, or eye coverage. Due to Jim’s effort, 96% of the children in our county now have coverage.” – Kathleen King, Executive Director of Santa Clara Family Health Foundation, Santa Clara County Medical Association’s 2011 Citizen of the Year “Jim Beall deserves credit for helping make Valley Medical Center one of the finest public hospitals in the United States. His tireless advocacy led to our new outpatient specialty center, our new main hospital, and so much of the quality and excellence associated with VMC. His work at the Board of Supervisors carried over to the Assembly, as he has been looking out for our safety net institutions non-stop since. He is a hero. He is my hero.” – E. Chris Wilder, Executive Director of the VMC Foundation. Jayhawks. After serving in the United States Army for four years, he began orthopaedic residency at the University of California San Francisco, followed by a postgraduate fellowship year in Hong Kong with Dr. Hodgeson, where he learned the pioneering surgery of the spine from the anterior approach, which Dr. Hodgeson had developed to take care of his complex problems including tuberculosis, scoliosis, major deformities, infection, and tumor. On his return to the Santa Clara Valley, he put into practice the advanced techniques of anterior approach spine surgery at Valley Medical Center and Stanford, and began to teach these techniques to other spine surgeons in the local area, including Kaiser and the other valley hospitals. This has represented a major improvement in the treatment of Complex Spinal Surgery, benefiting thousands of patients to the present day. He retains his position as clinical professor of surgery in the Department of Orthpaedics at Stanford University, to the present day. Steve has also been very active in the Santa Clara County Medical Association, joining the medical association in 1978. He began his private practice in orthopaedics in 1981, in Los Gatos. He was chief of staff of Community Hospital of Los Gatos in 1988, followed by the governing board. He was president of SCCMA in 1990–1991, and has been a delegate to the CMA House of Delegates for several years. He joined the administration of the NORCAL Mutual Insurance Company, which was originated by our Medical Association, beginning in 1982. He was elected to their board in 1985 and became chairman of the NORCAL board from 1996–2008. He was chairman of the Physician Insurers of America (PIA) from 1994–1996. He was a founding member of the National Patient Safety Foundation, and chairman of the Professional Liability Committee of the American Association of Orthopaedic Surgery (AAOS) from 1994– 1997. He was the AAOS Representative to the AMA in 1994–1996. He is a member of the JCAHO Sentinel Event Advisory Committee, from 2002–present. Steve received the Outstanding Contribution to the Medical Association Award at this banquet in 1999. Overall, Steve has provided outstanding service to the medical community of Santa Clara County, which has expanded to include service to the state as well as the nation. SCCMA Award Presentations and Installation, from page 33 Medical Group. As CEO of the largest medical group in the nation, Dr. Pearl is responsible for the health care of more than three million Kaiser Permanente members. The Permanente Medical Group comprises approximately 7,000 physicians and 30,000 staff members and operates 21 medical centers in Northern California. He was selected as executive director and CEO of The Permanente Medical Group in 1998. In addition, he is the president and CEO of the Mid-Atlantic Permanente Medical Group, which serves 500,000 members in Maryland, Virginia, and the District of Columbia. Board certified in plastic and reconstructive surgery, Dr. Pearl received his MD from the Yale University School of Medicine. He completed his residency in plastic and reconstructive surgery at Stanford University and currently serves on the faculty as a clinical professor of plastic surgery. In addition, he is on the faculty of the Stanford Graduate School of Business and teaches courses on strategic thinking and strategic change. Selected by Modern Healthcare as one of the most powerful physician leaders in the nation, Dr. Pearl has published more than 100 articles in various medical journals and has been a contributor to many books. He has made more than 100 presentations at national meetings in the areas of both clinical medicine and medical economics. In the past several years, he served as a visiting professor at Duke University School of Medicine, Haas School of Business, and Harvard School of Public Health. As a frequent lecturer on health care, Dr. Pearl is an advocate for the power of physician-led, integrated medical delivery systems. He believes that organizations like Kaiser Permanente, in which physicians collaborate rather than compete, and in which a multi-specialty medical group works in partnership with a not-for-profit health plan and hospital system, are able to provide superior quality of care over fragmented, insurance-based systems. of Cardiology at Kaiser Santa Clara, and chair of the Chiefs of Cardiology of Northern California. Following her cardiology fellowship, she joined the faculty at George Washington University as an assistant professor in the Lipid Research Clinic, where she became convinced of the importance of treating hypercholesterolemia and prevention. When she joined Kaiser in 1989, she soon began working to improve cardiac risk factor reduction. She pioneered an integrated, multi-disciplinary approach to disease management, which capitalized on Kaiser’s extensive patient databases and coordinated care among pharmacists, internists, and subspecialists. Her work led to the development of the Cholesterol Management and MultiFit Cardiac Rehab Programs throughout Kaiser Northern California and she remains the regional director of these programs. Cardiovascular disease is the leading cause of death in all parts of the United States, with one exception: among Kaiser Permanente members in Northern California. Under the guidance of Dr. Levin during her term as chief of cardiologists for TPMG, she instituted a population management program that was so successful the mortality rate, due to cardiovascular disease, was decreased dramatically enough to relegate cardiovascular disease to the second cause of death among Northern California Kaiser Permanente patients. By championing a population-based approach to cardiac disease prevention, Dr. Levin has helped improve care for hundreds-of-thousands of patients with or at-risk for heart disease. programs for the community pulmonologists, and continually stressed the importance of lifelong education. Bill involved residents, fellows, and faculty alike in scholarly writings through publication of observations and participation in research, scholarly textbooks, and clinical vignettes at the meetings of his professional organizations. Bill served as program director and chairman of the Department of Medicine for 21 years. As chairman of the Department of Medicine, Bill provided the leadership needed to continue attracting medical students to the field of internal medicine and the subspecialty of pulmonary-critical care. He did this through his faculty development and selection of key individuals to serve as his co-directors for the various residencies under his direction. These residencies helped train not only internists and primary care physicians, but dermatologists, anesthesiologists, radiologists, and other specialties as well. The characteristics Bill sought from his key faculty included a firm commitment to excellence in teaching, stressing the fundamentals of humanism, and the primacy of the patient, achieved through thorough history taking and the hands-on physical examination. He was honored by the American College of Physicians, receiving the 2011 Distinguished Teacher and Mentor Award. Throughout his careers, Bill exemplifies leadership by example. He has placed teaching and mentorship at the top of his priorities and built the Department of Medicine on a foundation of life-long learning, serving as the foundation for providing the best of medical care. Bill has shown that teaching others motivates them to strive for excellence in delivering the highest quality of care, regardless of an individual’s ability to pay. William Jensen is an individual deserving of recognition by his students, peers, colleagues, and patients for outstanding contributions to the training of physicians in our community. has worked as a pathologist at Kaiser in San Jose, since 1981. In 1989, he became president of the San Francisco-Bay Area Chapter of Physicians for Social Responsibility (PSR) and, in 2003, was president of the National PSR. Since 1986, Dr. Gould has been a leading member of the Peace Caucus of the American Public Health Association, for which he is currently chairperson, and in 2009, the American Public Health Association (APHA) awarded Dr. Gould the prestigious Sidel-Levy Award for Peace in New York. He has published many articles, authored many chapters in books, and spoken on a range of subjects including health effects of nuclear and biological weapons, prevention of nuclear terrorism, war and public health, U.S. chemical policy, climate change, and the greening of hospital practices. This wealth of knowledge, experience, and networking has propelled our Environmental Health Committee, and indeed the medical association, to new heights in public health action. Since 1992, he has been a leading member of our Environmental Health Committee. In addition, through this work as a CMA delegate for over a decade, he has authored and submitted numerous resolutions adopted by CMA as policy, including resolutions calling for preventing dioxin waste from medical facilities, preventing human exposure to mercury, reducing the use of pesticides, protecting farm workers from toxic pesticide exposures, reducing air pollution for binding reductions in global climate change, for the abolition of all weapons of mass destruction, and for avoiding accidental nuclear war. For his work within CMA, Dr. Gould received the Santa Clara County Medical Association’s (SCCMA) “Outstanding Contribution in Community Service” award in 2001. Dr. Gould’s contributions have been invaluable to our association. We so appreciate his time, input, and service to the SCCMA. His passion to make our world a healthier and safer place is an inspiration to us all. Fighting for you! CALPAC needs your help to support candidates and legislators who understand and embrace medicine’s agenda. Our top priorities are: 1. Protect MICRA 2. Preserve the ban on the corporate practice of medicine 3. Provide solutions to our physician shortage crisis! www.gilroygardens.org	CODE:	SCCMAMCMS	Adult	Admission	$44.99	$22.00	Child/Senior	Admission	$34.99	$22.00	. Brandon Vaccaro Photography, is a full service photography & videography studio. We specialize in upscale weddings, portraits events & headshots sessions. Our Studio serves the entire San Francisco Bay Area & Destination Cities. 15% Discount when you mention this ad. Outgoing-president William Lewis, MD, passes the gavel to incomingpresident Rives Chalmers, MD. Silver sponsor attendees from Kaiser San Jose/TPMG celebrate the special evening with award honoree Robert Gould, MD. L to R: Award Honorees Steve Fountain, MD; Donna Spagna; Robert Gould, MD; Robert Pearl, MD; Eleanor Levin, MD; and William Jensen, MD. Award Honorees David Quincy, MD, and Assemblymember Jim Beall are not in picture. William Parrish (SCCMA CEO) presents a thank you gift to outgoing president William Lewis, MD. Platinum sponsor Kaiser Santa Clara/TPMG attendees celebrate with award honorees Robert Pearl, MD, and Eleanor Levin, MD. Award Honoree Assemblymember Jim Beall presents the audience with his acceptance speech for the Citizenâ&#x20AC;&#x2122;s Award. SCCMA Award Honoree William Jensen, MD, enjoys the special evening with his family. SCCMA Award Honoree David Quincy, MD, celebrates his honor with wife Jane Varner, MD. SCCMA physician members, guests, and sponsors enjoying good food, wine, and good company. SCCMA Award Honoree Eleanor Levin, MD, enjoys the evening with family and friends. SCCMA Award Honoree Steve Fountain, MD, enjoys the dinner and special celebration with family and friends. L to R: Jo Matheson (Comerica Bank), Helen Wang, RN, John Longwell, MD (Past President), Robert Burnett, MD (Past President), Fred Armstrong, MD (Past President), Gladys Armstrong, Olga Nespole, and Tony Nespole, MD (Past President). SCCMA Alliance Award Honoree Donna Spagna poses with friends Jean Cassetta, Suzanne Jackson (Alliance Chair), and Kathleen Miller. Rives Chalmers, MD (2012-13 President), celebrates his installation and special evening with family and friends. SCCMA Award Honoree Steve Fountain, MD, and family appreciated the elegant atmosphere of the Fairmont Hotel. Award Honoree Eleanor Levin, MD, poses with Joanne Silberstein and Jane Hiatt Pearl. SCCMA Treasurer James Crotty, MD, enjoys the evening with fellow colleagues, Robert Levan, MD and Christine Levan, MD. SCCMA Past President and CMA Trustee Martin Fishman, MD, and CMA President (2012-2013) Paul Phinney, MD, enjoy the camaraderie. William Parrish (SCCMA CEO) presents an iPad 3 gift to the winner of the door prize drawing, Seham El-Diwany, MD. SCCMA President Rives Chalmers, MD; SCCMA Past President (2010-11) Thomas Dailey, MD; and Rosemary Kamei enjoy the evening. SCCMA Award Honoree Robert Pearl, MD, and his wife Jane. for gastrointestinal disease). 3. Poultices (topical concoctions used to treat visible tumors). 4. Trephination (placing holes in the skull to treat such conditions as “water on the brain”). 5. Surgical procedures involving the kidney – the draining of abscesses or removal of stones. 6. Treatment of fractures and dislocations with splinting and manipulation. 7. Vasectomy – recorded as a surgical procedure for permanent birth control. Some of Hippocrates other accomplishments include: 1. Treating the king of Macedonia, who was suffering from consumption. 2. Predicting the spread of epidemics based on wind patterns. 3. Founding a medical school in Cos in 400 B.C. 4. Being listed by Plato as the master of his art. 5. Although not the sole author, he contributed to one of history’s most famous documents, the Hippocratic oath. This is printed below in its complete form. I swear by Apollo the healer, by Aesculapius, by Health and all the powers of healing, and call to witness all the gods and goddesses that I may keep this oath and promise to the best of my ability and judgment. I will pay the same respect to my master in the Science as to my parents and share my life with him and pay all my debts to him. I will regard his sons as my brothers and teach them the Science, if they desire to learn it, without fee or contract. I will hand on precepts, and all other learning to my sons, to those of my master, and to those pupils duly apprenticed and sworn, and to none other. I will use my power to help the sick to the best of my ability and judgment; I will abstain from harming any man by it. I will not give a fatal draught to anyone if I am asked, nor will I suggest any such thing. Neither will I give a woman means to procure an abortion. I will be chaste and religious in my life and in my practice. I will not cut, even for the stone, but I will leave such procedures to the practitioners of that craft. Whenever I go into a house, I will go to help the sick and never with the intention of doing harm or injury. I will not abuse my position to indulge in sexual contacts with the bodies of women or of men, whether they be free men or slaves. Whatever I see or hear, professionally or privately, which ought not to be divulged, I will keep secret and tell no one. If, therefore, I observe this oath and do not violate it, may I prosper both in my life and in my profession, earning good repute among all men for all time. If I transgress and forswear this oath, may my lot be otherwise. Hippocrates died in 377 B.C. He left behind two sons, Thessalos and Dracon, who apprenticed under their father and carried on his tradition. DocBookMD is provided FREE to SCCMA and MCMS members thanks to NORCAL. Switch easily and seamlessly between up to two devices: iPhone or Android, and an iPad or iPod touch. • First download DocBookMD from the iTunes App Store or Google play • Open up the app on your device to begin the registration process. You will need your Medical Society ID number. If you do not have it, contact your medical society for assistance. on Sunday, June 10. The SCCMA Alliance set up a display informing participants about one of the potential perils of summer: running into a store for a quick errand and leaving a child in a car – just for a minute. (When temperatures inside a vehicle exceed 88 degrees, potential lethal temperatures can be reached in less than 20 minutes.) The SCCMA Alliance is involved in a statewide awareness campaign to inform people about the dangers of leaving a child or pet in an enclosed car. At the Duck Race, Alliance volunteers distributed over 1,400 static window stickers, posters, and bookmarks to parents, police officers, local firefighters, and hospital personnel. These reminders can be placed in windows of vehicles and offices. 2012-2013 Alliance Membership Renewal Forms can be located at the SCCMA Alliance website at www.sccmaa.org. Please visit the website to learn more about opportunities and events in the organization. Alliance members Donna Spagna, Suzanne Jackson, Kathleen Miller, and Mary Hayashi, plus official mascot, at the Silicon Valley Duck Race held at Vasona Park on June 10. Mary Hayashi, Donna Spagna, and Kathleen Miller at the Alliance information booth at the Silicon Valley Duck Race. Donna Spagna, Fulvio Spagna, and Kathleen Miller at the SCCMA Awards Banquet. At the SCCMA Awards Banquet, Suzanne Jackson presents Donna Spagna with the award for Alliance Member of the Year. Designed Representing healthcare providers and their families for over 40 years. available from 1,000 to 2,500+ sq. ft. Timeshare also available. Call Betty at 408/8482525. DOWNTOWN MONTEREY OFFICE FOR SUBLEASE Spacious, recently remodeled, excellent parking, flexible terms. Call Molly at 831/6449800. MEDICAL/PROFESSIONAL OFFICE FOR LEASE Medical/Professional office 2,600 sq. ft, ground floor near Santana Row. $2.00 sq. ft. Available now. Email at sksiddiqui@yahoo. com. PRIME MEDICAL OFFICE FOR LEASE • SAN JOSE Excellent location. Westgate area. 1,584 sq. ft. West Valley Professional Center, 5150 Graves Ave. Suite 2/stand-alone unit. Private office, reception area, exam rooms with sinks. Available 2/1/11. Call owner at 408/8671815 or 408/221-7821. SANTA CLARA OFFICE • HOMESTEAD AND JACKSON Plumbed for Dental/Medical, or other use. 1,200 sq. ft. Downtown across from post office and weekly farmers market. Excellent Location! Dentist on site, please do not disturb. Don’t miss! Come see! Call 408/838-8191 or 408/741-1956. opportunity for the right candidate to step into a successful growing practice. Must have excellent communication, clinical, and interpersonal skills. Excellent salary and benefits with bonus opportunities. Please fax CV to 408/278-3181 or email Tania_mcadams@ sanjosemed.com. EMPLOYMENT OPPORTUNITY Physician/Locum tenens for Family/Internal Medicine. Office based practice only. Coverage mostly needed during vacation. Parttime, must have excellent communication, interpersonal and clinical skills. Please fax CV to 408/356-6676. FOR SALE SL65 MERCEDES BENZ V12 Twin Bi Turbo 604 HP. Silver metallic, light grey interior at $13,000 original down. Contact 408/621-4350. $80,000. OPHTHALMOLOGY PRACTICE FOR SALE OR PARTNERSHIP Office is 11 years old. PPO, Medicare, and cash. Take over very low rate payment on office loan plus a small amount of cash. Call 408/871-6800. WANTED OFFICE SHARING Recapture the spirit of healing. Overhead sharing in beautiful women’s wellness center in Carmel, CA. Call Dr. Taylor at 831/622-1995 or email DrTaylor@womanswellspring.com. What is great service? For NORCAL Mutual insureds, just 1 phone call is all it takes for great service. That means calling during business hours and immediately reaching a live, knowledgeable, friendly expert. After hours, it means promptly receiving a call back from a professional qualified to help with your issue. No automated telephone tango. Questions are answered and issues resolvedâ&#x20AC;&#x201D;quickly. Weâ&#x20AC;&#x2122;re on call 24 hours a day, every day of the year. Great service brings you peace of mind. Great service 24/7. Hard-working numbers you can count on. Call 1-800-652-1051 or visit norCalmutual.Com Proud to be endorsed by the Monterey County Medical Society and the Santa Clara County Medical Association.